We have so many exciting Horse Riding Holidays worldwide to choose from, that we’ve broken them down into various types to help you find the one to suit you best. Some of our Horse Riding Holidays may fall into two or even three categories. For example, a Ranch Holiday may also be listed as a Family Holiday if it’s at a child-friendly venue, and possibly a Luxury Holiday too, depending upon accommodation there. For this reason, you’ll often see the same holiday fall under different headings as you browse our selection. On a Beach Horse Riding Holiday, some, most or all of the riding will be done on the golden shores of such attractive locations as Spain, Italy, Australia, and even Mozambique. They are generally suitable for intermediate to advanced riders only, as there can be lots of galloping and cantering, or challenging terrain such as sand dunes. However, our Retzlaff Safari in Mozambique holiday is suitable for people of all riding abilities. On an Expedition Horse Riding Holiday, you’ll basically be following a set route or be bound for a particular destination. It could be a trek through Patagonia or the Namibian Desert; a climb over the Canadian Rockies; or a trip through the Sacred Valley of Peru, taking in a visit to the famed ‘lost city’ of Macchu Piccu. Accommodation will change each night because of the nature of the trip, and as all your belongings must also be carried along each day, it is generally better to pack lighter than you might do for a centre-based holiday. Our Family Horse Riding Holidays are suitable for horse lovers of all ages – and even non-horse lovers too! That’s because many of our family-friendly centres also offer various other attractions and activities for people who don’t ride, whether they be children or adults. For those who do want to travel on horseback, most of our Family Horse Riding Holidays centres are suitable even for beginners, but some do ask for some level of prior riding experience. What better way for two horse lovers to celebrate their marriage than taking in a Horse Riding Holiday for their honeymoon! The focus is firmly on luxury here, as our suggested Honeymoon Holidays are to centres with top-class accommodation and fine dining. Destinations and activities are as far-flung as polo in Argentina or visiting the Winelands of South Africa, and as close to home as the unique Castle Leslie in County Monaghan, Ireland – so there’s something to appeal to everybody. Most – if not all – of our holidays qualify as ‘luxury’ compared to some other operators, but still, some are more luxurious than others! The focus here is on high-quality accommodation and top-class dining, usually with a mix of local cuisine and international favourites. Destinations are as widespread as Canada, Argentina, and Africa, and we have luxury riding holidays to suit all levels of riding ability. Come on a Ranch Horse Riding Holiday with us and you can enjoy the real John Wayne experience – or even Billy Crystal in ‘City Slickers’ if that’s more thing! We have Ranch Holidays not only in the USA, but also in Canada, Latin America, Africa, and even France. Most are on genuine working ranches, featuring real cattle trail rides at certain times of year. 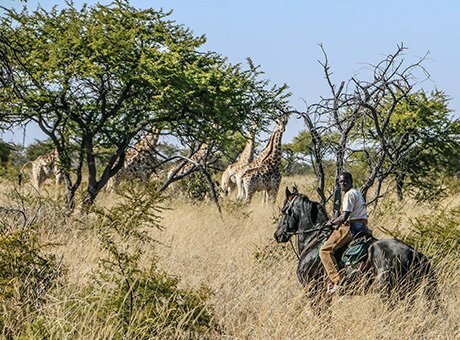 We have a wide range of Safari Horse Riding Holidays throughout Africa, allowing you to get up close to some of the planet’s greatest wildlife from a perch on the back of a trusty steed. Horseback is a great way to enjoy a safari, as you are much more at one with nature yourself than you would be if travelling in a four-wheel drive jeep. Your horse can even be an added line of defence if there are larger animals lurking, as he will sense an unseen lion or buffalo nearby, while a jeep most certainly will not! If you would like to either try Dressage for the first time, or else further develop your Dressage skills, we have a selection of Training in Dressage Horse Riding Holidays to locations in Spain, Italy, Portugal, and Ireland. All Dressage Centres feature expert teachers and magnificent horses. 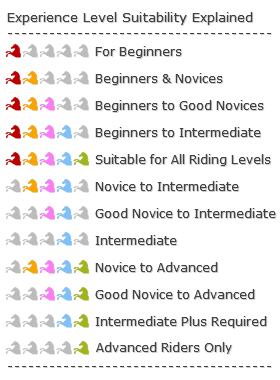 Some cater for absolute beginners and some are for intermediate and advanced riders only, but the common thread is an experience that will be both unforgettable and educational. We have a great selection of Short Break Horse Riding Holiday for when you’ve only a few days off, or when you want to fit some horse riding into a longer holiday. There’s something for people of all riding ability, and many can be booked on a ‘per night’ basis, so you can stay for as short or as long a time as suits you best. We have ‘close to home’ destinations in both the UK and Ireland, and ‘far-flung’ short breaks in South Africa, the USA, and more, for if you’re going to be in those countries anyway. Take the time to do some horse riding while there and make your holiday all the better! Just use the filters to find what you’re looking for, then read up all about your chosen holiday, contact us, and we’ll make it happen for you!